Gulan, 19, Zerya, 18, and Zilan, 17, Sinjar, Iraqi Kurdistan. After the Syrian war began in 2011, Berlin-based photographer Sonja Hamad saw many images of Kurdish female fighters -- but felt they did not do the women justice. "The images were very sensational," she says. "The women were depicted in the same way as men -- always holding weapons. The pictures didn't say anything about the women as individuals." Born to Kurdish Yazidi parents in Damascus, Syria, in 1986, Hamad was 3 years old when her family moved to a small town in Germany's North Rhine-Westphalia state. Growing up, Hamad struggled to talk openly about her background with friends, and says she finds it easier to communicate through a visual medium -- especially photography. Between March 2015 and December 2016, Hamad made three trips to Iraqi Kurdistan and the Kurdish-controlled region of Rojava in northern Syria to meet -- and photograph -- the women behind the guns. Her images of fighters are collected in "Jin -- Jiyan -- Azadi" -- "Women, Life, Freedom." ● 25-30 million Kurds live in Kurdistan. ● Kurds have been fighting for independence for a century, but have never achieved nation-state status for Kurdistan. 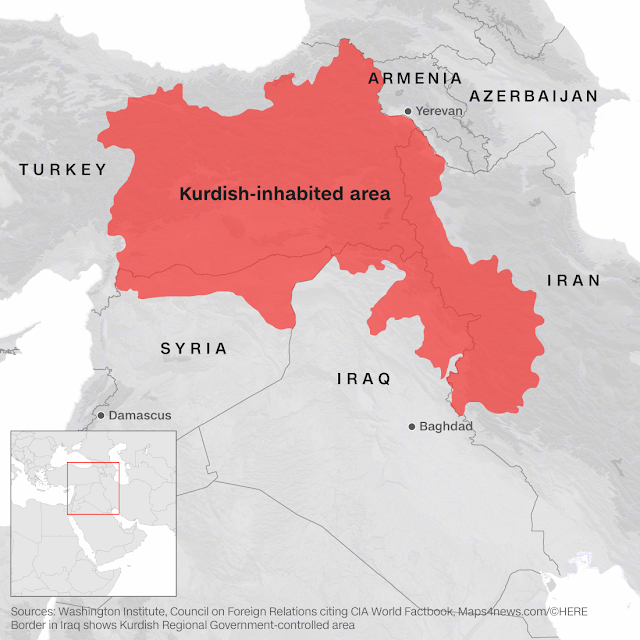 ● Kurds have established semi-autonomous regions in Iraq and Syria. In Turkey and Iran, they live under central government rule. ● In Syria, the armed wing of the Kurdish Democratic Union Party is called the YPG (People's Protection Units). Its female brigade is called the YPJ (Women's Protection Units). ● The Free Women's Unit, or YJA Star, are the female guerrilla units of the Kurdistan Workers' Party (PKK) which is based in Turkey and Iraq. When Hamad met her, Dijlin had been fighting for three years and had spent half that time on the front line. Despite being injured, and against the will of her family, she continues to fight. Hamad says she built a "deep and honest connection," with the fighters. "We treated each other like sisters," she says. In the mountains of northern Iraq, Hamad met members of YJA Star -- the female guerrilla units of the Kurdistan Workers' Party (PKK), which spearheaded Kurdish women's military involvement. Diljin told Hamad that she is fighting for women's rights. According to Hamad, many of the fighters are waging war on the patriarchy -- as well as enemy combatants. Kurdish women typically marry at a young age and "even if they want to go on a walk, they have to ask permission," she explains. "They experience high levels of stress," says Hamad. She says traumatic events occur so rapidly that the women don't have time to process their experiences. "These young women are much more mature than their counterparts in Europe, because they have experienced so much already." Many women fighters are followers of Abdullah Ocalan, the imprisoned leader of the Kurdistan Workers' Party (PKK). Posters of Ocalan are a common sight in Iraqi Kurdistan. Hamad says that women's liberation is deeply rooted in PKK ideology. "Ocalan has stated that 'the land cannot be free when women are not free,'" she says. "Even from his Turkish jail cell he is sending the women mental ammunition for their emancipation." The YPJ battalions occupy empty houses abandoned by families fleeing the conflict. A volunteer force, they are not paid and rely on locals and the military for their food and supplies. "The local Kurdish community are extremely supportive," says Hamad. Hamad visited the location of the battle's first frontline, near the Iraq border, where the fighters had been stationed while defending the city. She explored the houses that had been destroyed -- their windows smashed in and walls punctured by bullet holes. The female Kurdish fighters have had a "definite impact on the male part of Kurdish society," says Hamad. "When they see women with weapons and fighting, they learn to respect them." Αναρτήθηκε από mikres-ekdoseis στις 7:26 μ.μ.